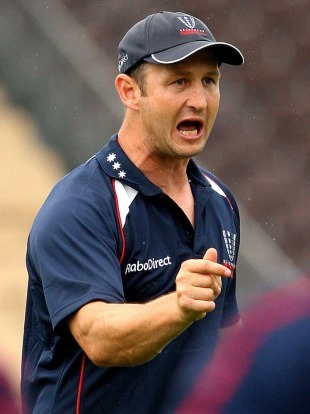 The Melbourne Rebels' horror run could produce more casualties with the future of coach Damien Hill in doubt. Hill is due off contract at the end of the Super Rugby season and he's under immense pressure after the Rebels chalked up their fifth successive loss. The Rebels flew into Perth on Monday following a winless South African tour, which included a club-record 10-try defeat and the sending home of Wallabies Kurtley Beale and Cooper Vuna for a post-match altercation. The troubled Beale remains suspended indefinitely. Melbourne chief executive Steve Boland said the entire club needed to see some positive results. "We've had some discussions with Damien," Boland said. "The coaching window and player recruitment window can't wait until the end of the season for those sorts of decisions so we need to make a decision on our coach well before the end of the year." The Rebels have slumped to 13th on the ladder with just one win despite bringing in Wallabies backrower Scott Higginbotham to join fellow Test regulars Beale, James O'Connor and Nick Phipps. "We're all in the same boat. We need to see some performances that justify the team we've got and the effort everybody's putting in," Boland said. Among the rumblings of discontent, O'Connor, also coming off contract, has been linked to the high-flying Brumbies as revealed exclusively by ESPNscrum yesterday. Boland said the franchise had started discussions with O'Connor and they wanted him to remain a Rebel. "I had a discussion with his agent 10 days ago and we're working through it," Boland said. "At that meeting there was no mention of him talking to other clubs." The Brumbies are understood to retain unfavourable memories of their negotiations with O'Connor back in 2011 when he left the Western Force. He reportedly agreed to terms then only to join the Rebels. The Rebels' only win this season came in round one at home against their next opponents, Western Force. The Rebels have won four out of five matches played against the Force and will be desperate to extend that record in Perth on Saturday night. Vuna, who was sent home from South Africa with Beale for his role in the fracas, has rejoined the side in Perth. The club's leading tryscorer for the past two seasons, Vuna has only managed one game this season after fracturing his shoulder in a pre-season match. In some welcome good news, the Rebels are believed to be close to announcing the signing of 23-year-old prop Max Lahiff from UK club London Irish. Lahiff, who has an Australian father, is an athletic loosehead.